Ladyburg nails! | details in the fabric.. Growing up in America, these adorable red-and-black insects were introduced to me as “ladybugs“. 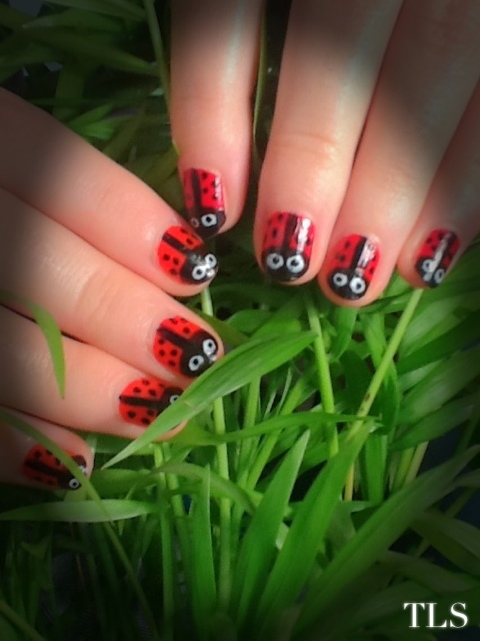 When I moved back to England however, I discovered they were known as “ladybirds“. To this day, I have never understood why this difference has come about, however I have settled on calling them “ladyburgs“. Best of both worlds, I think. Previous Meet Sid, the goldfish. Next Procrastinating, I am. (Yoda cat). So cute! And you did it yourself. I’m amazed. Nail art is difficult, for me at least. Very cute :) I tried this one long back but turned out kinda messy.. I recently bought Nail Art pens (60 of them) and couldn’t wait for them to arrive, as Blogging; I come across lots of designs that I would like to try out on my nails. However, since receiving them; I just haven’t got round to doing them and couldn’t even decide on a pattern to do! Oh these are so adorable. Lady bugs are a sign of good luck, I think. Either way they’re so cute.